What if she would rent out the place? She made so little use of it these days. 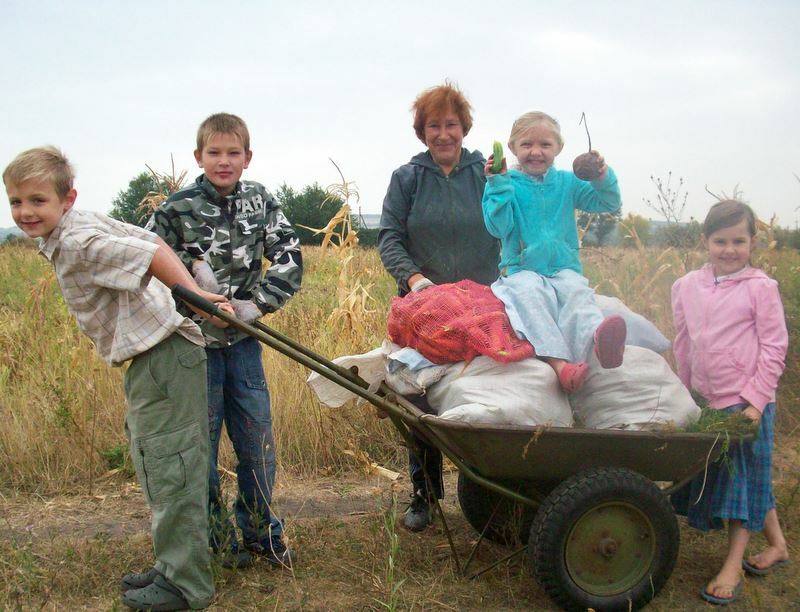 Old Lena Stepanovna had told her a pastor in Shastya was looking for a house for an American family with five children. So what if the renters would be foreigners? Pyotr, her older brother, worried and grouched. What if, he said, it was just a scheme to get her land? Why else would Americans come to their Ukrainian village of Artyoma? She would move off her couch. She would rent out the house to these people. And she would watch them. Watch what was hers. The foreigner family never found out what Olla thought of them the cold night they tumbled into her house, shell-shocked from their long journey from the States. She couldn’t have thought them too intimidating: Philip, the tall American preacher, struggling to get out his rusty bits of Russian; Tonya, his pregnant wife, too exhausted to care when Olla’s kid goats escaped out of their box and urinated on the kitchen floor; and all those little boys and girls, five of them, wide eyed. But after that night, the house no longer stood too empty, silent, and dark. As the black-earthed countryside warmed and pushed out drifts of green grasses and clouds of cherry blossoms, Olla established herself as the family’s babushka, their grandmother. “Baba Olla,” she told them to call her. They needed so much help, these Americans. They didn’t know that they would need rows of parsley and onions, so she planted it all for them. She shared her tools when they wanted to plant sweet corn—corn for themselves, interestingly, and not for animals. They didn’t know how to preserve jam, so she brought over her jars and showed them. She brought over red kalina berries to help with the children’s colds. She was patient with the family’s slowly growing language abilities and tried using a little English herself. She helped them know whom they could trust in the village. At times, the Americans baffled her. Why had they insisted on following their own recipe for pickles? What a disaster! Why did Philip want to follow instructions from a mere book on the best way to plant potatoes? She had him dig up his potatoes and replant them the way Ukrainians ought to—as even the Cossacks had, no doubt. She brought them a pot of borscht every Sunday and left a liter of goat milk on their steps several times a week. She brought over a prickly hedgehog to delight the children. In the fall, she let the children help her with harvesting carrots, beets, and potatoes. She taught them how to milk her goats. And Baba Olla would sit in the big house and learn to eat chocolate cake and salted popcorn. They let her take their newborn baby girl into her arms—to her amazement, because, according to local Ukrainian culture, she had not held her own grandchildren until they were at least a few months old. And she laid claim to the little bit of new life, often taking her outside to sing to her, look at the goats, visit the neighbor. The worry lines in her face more frequently crinkled into smiles at the children who ate her cookies and the man and woman who shared tea and conversation with her. Eventually, Baba Olla told them about the dark days. She and her husband had built this house together. Two sons were born to them. Her husband, a heavy drinker, died of a heart attack while in his late forties. One month after his death, her 19-year-old son was killed in a motorcycle accident. Her remaining son married and eventually had a son and daughter. One year before the American family moved into Olla’s home, her son had died under suspicious circumstances in his bed. According to Baba Olla, no one had investigated his death properly. She had outlived her husband and sons. Justice had not been served. And the dark, lifeless days had come. They were heading back to the States. Packing for yet another move always made Tonya teeter on the edge of overwhelm. You pack the clothes, the mementos, the books, the medicine cabinet…But what do you do with the odds and ends? That toy, this rubber band, the plaque, a match book? And what about making sure all that was borrowed gets returned to the right people? That basket used for toting produce from the garden, for instance. She thought it belonged Olla’s boyfriend Slavic. Olla would know. Tonya blinked at the older woman. This strong woman who had weathered so many difficult years. This woman who had opened her home, her hands, and her heart to strangers. The suspect Americans. And Tonya, eyes misting, understood Olla was saying. The basket wasn’t Tonya’s. It was Olla’s basket. But she had said nashi. We value your story, your website – and you. Dwight for both of us.